Palm oil, produced from the oil palm, is a basic source of income for many farmers in South East Asia, Central and West Africa, and Central America. It is locally used as a cooking oil, exported for use in many commercial food and personal care products and is converted into biofuel. It produces up to 10 times more oil per unit area than soyabeans, rapeseed or sunflowers. Oil palms produce 38% of the world's vegetable-oil output on 5% of the world’s vegetable-oil farmland. Palm oil plantations are under increasing scrutiny for their effects on the environment, including loss of carbon-sequestering forest land. There is also concern over displacement and disruption of human and animal populations due to palm oil cultivation. An estimated 1.5 million small farmers grow the crop in Indonesia, along with about 500,000 people directly employed in the sector in Malaysia, plus those connected with related industries. As of 2006, the cumulative land area of palm oil plantations is approximately 11,000,000 hectares (42,000 sq mi). In 2005 the Malaysian Palm Oil Association, responsible for about half of the world's crop, estimated that they manage about half a billion perennial carbon-sequestering palm trees. Demand for palm oil has been rising and is expected to climb further. Between 1967 and 2000 the area under cultivation in Indonesia expanded from less than 2,000 square kilometres (770 sq mi) to more than 30,000 square kilometres (12,000 sq mi). Deforestation in Indonesia for palm oil (and illegal logging) is so rapid that a 2007 United Nations Environment Programme (UNEP) report said that most of the country’s forest might be destroyed by 2022. The rate of forest loss has declined in the past decade. Global production is forecast at a record 46.9m tonnes in 2010, up from 45.3m in 2009, with Indonesia providing most of the increase. Oil palm is a valuable economic crop and provides a source of employment. It allows small landholders to participate in the cash economy and often results in improvements to local infrastructure and greater access to services such as schools and health facilities. In some areas, the cultivation of oil palm has replaced traditional practices, often due to the higher income potential of palm oil. However, in some cases, land has been developed by oil palm plantations without consultation or compensation of the indigenous people occupying the land. This has occurred in Papua New Guinea, Colombia, and Indonesia. In the Sarawak state of Malaysian Borneo, there has been debate over whether there was an appropriate level of consultation with the Long Teran Kanan community prior to the development of local land for palm oil plantations. Appropriation of native lands has led to conflict between the plantations and local residents in each of these countries. Palm oil plantations are currently rapidly threatening biodiversity, endangering hundreds of thousands of animal species into extinction, emitting enormously damaging and irrevocable carbon emissions into the atmosphere, and violating human rights. Children as young as seven years old are working excruciatingly long days in the heat in an effort to help support their families; sometimes they are not even paid at all. In addition to the environmental devastation, human rights are a separate but equally devastating problem associated with palm oil plantations. The palm oil industry has been named one in the top four worst industries for forced and child labor. According to a 2008 report by NGOs including Friends of the Earth, palm oil companies have also reportedly used force to acquire land from indigenous communities in Indonesia. Additionally, some Indonesian oil palm plantations are dependent on imported labor or undocumented immigrants, which has raised concerns about the working conditions and social impacts of these practices. The remaining distribution of the Sumatran orangutan in Indonesia. A Sumatran orangutan at Bukit Lawang, Indonesia. In Indonesia, rising demand for palm oil and timber has led to the clearing of tropical forest land in Indonesian national parks. According to a 2007 report published by UNEP, at the rate of deforestation at that time, an estimated 98 percent of Indonesian forest would be destroyed by 2022 due to legal and illegal logging, forest fires and the development of palm oil plantations. 2 emissions, and is a driver toward dangerous climate change. In some states where oil palm is established, lax enforcement of environmental legislation leads to encroachment of plantations into riparian strips, and release of pollutants such as Palm Oil Mill Effluent (POME) in the environment. More environment-friendly practices have been developed. Among those approaches is anaerobic treatment of POME, which might allow for biogas (methane) production and electricity generation, but it is very difficult to maintain optimum growth conditions for the anaerobic organisms that break down acetate to methane (primarily Methanosaeta concilii, a species of Archaea). Damage to peatland, partly due to palm oil production, is claimed to contribute to environmental degradation, including four percent of global greenhouse gas emissions and eight percent of all global emissions caused annually by burning fossil fuels, due to the clearing of large areas of rainforest for palm oil plantations. Many Indonesian and Malaysian rainforests lie atop peat bogs that store great quantities of carbon. Forest removal and bog drainage to make way for plantations releases this carbon.Researchers are looking for possible solutions and ways to help the situation and have suggested that if enough land is conserved and there remain large enough areas of primary forest reserves, the effects of the palm oil industry may not have as much of an impact on wildlife and biodiversity. Environmental groups like Greenpeace, the Roundtable on Sustainable Palm Oil, and the Amnesty International are also taking part in advocating bans on unsustainable palm oil crops and the companies that purchase these exports. 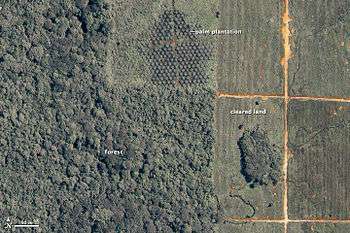 Environmental groups such as Greenpeace claim that this deforestation produces far more emissions than biofuels remove. Greenpeace identified Indonesian peatlands, unique tropical forests whose dense soil can be burned to release carbon emissions, that are being destroyed to make way for palm oil plantations. They represent massive carbon sinks, and they claim their destruction already accounts for four percent of annual global emissions. However, according to the Tropical Peat Research Laboratory, at least one measurement has shown that oil palm plantations are carbon sinks because oil palms convert carbon dioxide into oxygen just as other trees do, and, as reported in Malaysia's Second National Communication to the United Nations Framework Convention on Climate Change, oil palm plantations contribute to Malaysia's net carbon sink. Greenpeace recorded peatland destruction in the Indonesian province of Riau on the island of Sumatra, home to 25 percent of Indonesia's palm oil plantations. Growers plan to expand the area under concession by more than 28,500 square kilometres (11,000 sq mi) which would deforest half of the province. Greenpeace claims this would have devastating consequences for Riau's peatlands, which have already been degraded by industrial development and store a massive 14.6 billion tonnes of carbon, roughly one year's greenhouse gas emissions. Research conducted by Greenpeace through its Forest Defenders Camp in Riau documents how a major Indonesian palm oil producer is engaging in large-scale destruction of peatland in flagrant violation of an Indonesian presidential order and national forestry regulations. Palm oil from peatland is fed into the supply chain for global brands. FoE and Greenpeace both calculate that forests and peatlands that are replaced by palm oil plantations release more carbon dioxide than is saved by replacing diesel with biofuels. Environmentalists and conservationists have been called upon to team up with palm-oil companies to purchase small tracts of existing palm plantation, so they can use the profits to create privately owned nature reserves. It has been suggested that this is a more productive strategy than the current confrontational approach that threatens the livelihoods of millions of smallholders. In the two countries responsible for over 80% of world oil palm production, Indonesia and Malaysia, smallholders account for 35–40% of the total area of planted oil palm and as much as 33% of the output. Elsewhere, as in West African countries that produce mainly for domestic and regional markets, smallholders produce up to 90% of the annual harvest. As a result of Malaysia's commitment to retain natural forest cover on at least 50 percent of the nation's land, the growth of new palm oil plantations has slowed in recent years. According to Malaysia's Plantation Industries and Commodities Minister Bernard Dompok, significant expansion of palm oil is no longer possible, therefore Malaysian farmers are now focusing on increasing production without expansion. In January 2008, the CEO of the Malaysian Palm Oil Council wrote a letter to the Wall Street Journal stating that Malaysia was aware of the need to pursue a sustainable palm oil industry. Since then the Malaysian government, along with palm oil companies, have increased production of Certified Sustainable Palm Oil (CSPO). Malaysia has been recognized by the Roundtable on Sustainable Palm Oil as the largest producer of CSPO, producing 50 percent of the world's supply, and accounting for 40% of CSPO growers worldwide. Indonesia produces 35 percent of the world's CSPO. In Indonesia, the Indigenous Peoples' Alliance of the Archipelago (AMAN) under the direction of Mina Susana Setra has fought for policies that find balance between economic need and indigenous people's rights. 99% of the palm oil concessions in the country concern land that is occupied by indigenous people. In 2012, AMAN led an advocacy team which won a Constitutional Court case recognizing customary land rights; however, implementation of programs that protect indigenous rights, the environment and developers have failed to come to fruition except in limited cases. In Africa, the situation is very different compared to Indonesia or Malaysia. In its Human Development Report 2007-2008, the United Nations Development Program says production of palm oil in West-Africa is largely sustainable, mainly because it is undertaken on a smallholder level without resorting to diversity-damaging monoculture. The United Nations Food and Agriculture program is encouraging small farmers across Africa to grow palm oil, because the crop offers opportunities to improve livelihoods and incomes for the poor. Food and cosmetics companies, including ADM, Unilever, Cargill, Procter & Gamble, Nestle, Kraft and Burger King, are driving the demand for new palm oil supplies, demand was partly driven by a need for a replacement for high trans fat content oils. Although palm oil is used in the production of biofuels and proposals have been made to use it in large installations, a 2012 report by the International Food Policy Research Institute concluded that the increase in palm oil production is related to food demands, not biofuel demands. Biodiesel made from palm oil grown on sustainable non-forest land and from established plantations reduces greenhouse gas emissions. According to Greenpeace, clearing peatland to plant oil palms releases large amounts of greenhouse gasses, and that biodiesel produced from oil palms grown on this land may not result in a net reduction of greenhouse gas emissions. However, research by Malaysia's Tropical Peat Research Unit has found that oil palm plantations developed on peatland produce lower carbon dioxide emissions than forest peat swamp. However, it has been suggested that this research unit was commissioned by politicians who have interests in the palm oil industry. 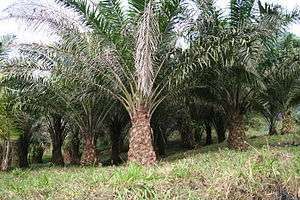 In 2011, eight of Malaysia's Federal Land Development Authority (FELDA) plantations were certified under the International Sustainability and Carbon Certification System (ISCC), becoming part of Asia's first ISCC certified supply and production chain for palm biodiesel. This certification system complies with the European Union's Renewable Energy Directive (RED). In 2012, the European Commission approved the RSPO's biofuel certification scheme allowing certified sustainable palm oil biofuel to be sold in Europe. The Roundtable on Sustainable Palm Oil (RSPO), founded in 2004, works to promote the production of sustainably sourced palm oil through involvement with growers, processors, food companies, investors and NGOs. Beginning in 2008, palm oil that meets RSPO introduced standards has been designated Certified Sustainable Palm Oil (CSPO). Within two years of implementation CSPO designated palm oil comprised 7 percent of the global palm oil market. As of October 2012, 12 percent of palm oil has been certified by the RSPO. However, in the first year of CSPO certification only 30 percent of sustainable oil was marketed as CSPO. In The Economist in 2010, the RSPO was criticized for not setting standards for greenhouse-gas emissions for plantations and because its members account for only 40 percent of palm oil production. 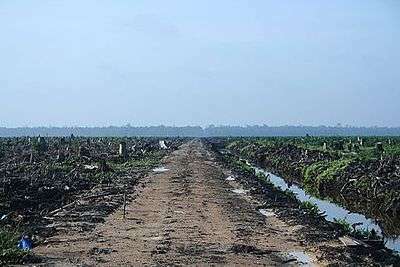 In a 2007 report, Greenpeace was critical of RSPO-member food companies saying that they are "dependent on suppliers that are actively engaged in deforestation and the conversion of peatlands". Following a contribution of $1 billion from Norway, in May 2010, Indonesia announced a two-year suspension on new agreements to clear natural forests and peatlands. Additionally, Indonesia announced plans to create its own organization similar to the RSPO, which, as a government certification system, will introduce mandatory regulation for all Indonesian palm oil producers. In 2011, Malaysia began developing a national certification, the Malaysia Sustainable Palm Oil (MSPO) certification, to improve involvement in sustainable palm oil production nationwide. The certification program, aimed at small and medium-sized producers, is expected to be launched in 2014. Malaysia has initiated its own environmental assessment on oil palm industry based on Life Cycle Assessment (LCA) approaches. LCA has been applied to assess the environmental impact of production of oil palm seedlings, oil palm fresh fruit bunches, crude palm oil, crude palm kernel oil and refined palm oil. The assessment on downstream industries such as oil palm plywood and bio-diesel. was also conducted. Oil palm producers are eligible to take part in Clean Development Mechanism (CDM) programs in which developed nations invest in clean energy projects in developing nations to earn carbon credits to offset their own greenhouse gas emissions and to reduce greenhouse gas emissions worldwide. Investors have been cautious about investing in palm oil biofuel projects because of the impact the expansion of oil palm plantations has had on tropical rain forests, but according to the South East Asian CDM development company YTL-SV Carbon, many CDM projects in the palm oil sector focus on improving use of waste products to reduce gas emissions and do not contribute to the establishment of new oil palm plantations. The World Wildlife Foundation (WWF) publishes an annual report on the use of sustainable palm oil by major corporations. In the 2011 report, 31 of the 132 companies surveyed received a top score for their use of sustainable palm oil. This represents an increase from 2009, the first year the report was issued, where no companies received top scores. The WWF reports that 87 companies have committed to using only sustainable palm oil by 2015, including Unilever and Nestlé, both of which committed to exclusively using sustainable palm oil following demonstrations and urgings from environmental organizations in the late 2000s. However, according to the WWF, the overall growth in the use of sustainable palm oil is too slow. Retailers who have made commitments to offering products containing sustainable oil, including Walmart and Carrefour, have attributed the slow rate of growth in the availability of sustainable palm oil to a lack of consumer interest and awareness in products made with sustainable palm oil. These companies have expressed concern about the potential impact of low consumer demand on the cost and future availability of sustainable palm oil. It may be possible to persuade governments of nations that produce competing products to enact protectionist legislation against the products of deforestation, an approach that was presented in a report by the National Farmers Union (United States) and Avoided Deforestation Partners. The 2010 report estimates that protecting the 13,000,000 hectares (50,000 sq mi) of mostly tropical forest that are lost annually worldwide would boost American agricultural revenue by $190–270 billion between 2012 and 2030. 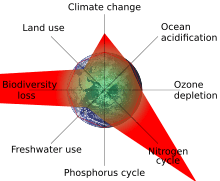 However, several conservation groups, including Conservation International, Environmental Defense Fund, National Wildlife Federation, and The Nature Conservancy, presented a rebuttal to the report, stating that it was "based on the assumption, totally unfounded, that deforestation in tropical countries can be easily interrupted, and its conclusions are therefore also unrealistic." ↑ "Stanford researchers show oil palm plantations are clearing carbon-rich tropical forests in Borneo". ↑ Wong, Jack (3 May 2010). "Oil palm planters urged to create corridors for wildlife". The Star Online. Retrieved 10 October 2012. 1 2 3 "Oro Landowners' Declaration on Large-Scale Commercial Extraction of Natural Resources and the Expansion of Oil Palm Nucleus Estates". Forest Peoples Programme. Retrieved 2007-11-29. 1 2 "MPOA and sustainable palm oil" (PDF). Malaysian Palm Oil Association. 2005. ↑ "Malaysian government not concerned with rising palm oil prices – minister". AFX News. Forbes Magazine. 2007-12-16. ↑ "Palm oil plantations already estimated at occupying 11 million hectares". WWF (Panda.org). Archived from the original on 2007-10-14. Retrieved 2007-09-29. 1 2 Budidarsono, Suseno; Dewi, Sonya; Sofiyuddin, Muhammad; Rahmanulloh, Arif. "Socio-Economic Impact Assessment of Palm Oil Production" (PDF). World Agroforestry Centre. Retrieved 15 January 2013. 1 2 Norwana, Awang Ali Bema Dayang; Kunjappan, Rejani (2011). "The local impacts of oil palm expansion in Malaysia" (PDF). cifor.org. Center for International Forestry Research. Retrieved 15 January 2013. ↑ The Report: Malaysia 2011. Oxford Business Group. 2011. p. 295. Retrieved 24 August 2012. 1 2 "Palm oil cultivation for biofuel blocks return of displaced people in Colombia" (PDF). iDMC. Retrieved 2007-11-29. 1 2 3 ""Losing Ground" - report on indigenous communities and oil palm development from LifeMosaic, Sawit Watch and Friends of the Earth". Forest Peoples Programme. 28 February 2008. Retrieved 4 January 2013. 1 2 Colchester, Marcus; Jalong, Thomas; Meng Chuo, Wong (2 October 2012). "Free, Prior and Informed Consent in the Palm Oil Sector - Sarawak: IOI-Pelita and the community of Long Teran Kanan". Forest Peoples Program. Retrieved 4 January 2013. ↑ "Ghosts on our Own Land: Indonesian Oil Palm Smallholders and the Roundtable on Sustainable Palm" (PDF). Forest Peoples Programme. Retrieved 2012-10-20. 1 2 Nellemann, Christian, ed. (6 February 2007). "The Last Stand of The Orangutan" (PDF). grida.no. United Nations Environment Programme. Retrieved 16 October 2012. 1 2 Morales, Alex (18 November 2010). "Malaysia Has Little Room for Expanding Palm-Oil Production, Minister Says". Bloomberg. Retrieved 10 October 2012. ↑ Doom, Justing (21 June 2012). "Deforestation Emissions May Be a Third of Prior Estimates". Bloomberg. Retrieved 10 October 2012. ↑ "Torgamba's Story". International Rhino Foundation. Retrieved 2007-12-11. ↑ Helen Buckland. "The Oil for Ape Scandal: How Palm Oil is Threatening the Orang-utan" (PDF). Friends of the Earth. Retrieved 2007-09-29. ↑ Ancrenaz, M.; Marshall, A.; Goossens, B.; van Schaik, C.; Sugardjito, J.; Gumal, M.; Wich, S. (2007). "Pongo pygmaeus. In: IUCN 2007. 2007 IUCN Red List of Threatened Species. <www.iucnredlist.org>". Retrieved 2008-04-02. ↑ Singleton, I.; Wich, S.A.; Griffiths, M. (2007). "Pongo abelii. In: IUCN 2007. 2007 IUCN Red List of Threatened Species. <www.iucnredlist.org>". Retrieved 2008-04-02. 1 2 "Cruel Oil. How Palm oil Harms Health, Rainforest & Wildlife" (PDF). Center for Science in the Public Interest. May 2005. 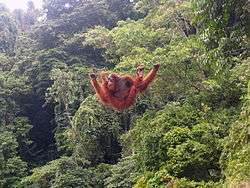 ↑ "Hundreds of orangutans killed in north Indonesian forest fires deliberately started by palm oil firms". Associated Newspapers Ltd. 30 March 2012. Retrieved 1 April 2012. ↑ "Indigenous community forcibly evicted for palm oil in Indonesian Borneo". Mongabay.com. 1 November 2011. Retrieved 10 October 2012. 1 2 "Cut Down Oil Palm on River Banks, Plantations Warned". New Straits Times. Retrieved 2007-12-01. ↑ "Environmental Impact Assessment (EIA) Guidelines for Oil Palm Plantation Development" (PDF). Retrieved 2007-11-29. ↑ "Promoting the Growth and Use of Sustainable Palm Oil". RSPO. Archived from the original on 2007-07-06. Retrieved 2007-12-01. ↑ Andre, Pachter (2007-10-12). "Greenpeace Opposing Neste Palm-Based Biodiesel". Epoch Times. Retrieved 2007-12-02. ↑ Land Clearing and the Biofuel Carbon Debt. Joseph Fargione, Jason Hill, David Tilman, Stephen Polasky, and Peter Hawthorne. Published online 7 February 2008 doi:10.1126/science.1152747 (in Science Express Reports) Environment, the National Science Foundation DEB0620652, Princeton Environmental Institute, and the Bush Foundation. We thank T. Searchinger for valuable comments and insights, and J. Herkert for providing references. Supporting Online Material www.sciencemag.org.Abstract Supporting Online Material. ↑ "Palm oil: Cooking the Climate". Greenpeace. 2007-11-08. Archived from the original on 2007-11-10. Retrieved 2007-12-02. ↑ "The truth about oil palms and carbon sinks". New Straits Times. 7 November 2010. Retrieved 7 January 2013. ↑ Malaysia: Second National Communication to the UNFCCC (PDF) (Report). Ministry of Natural Resources and Environment Malaysia. Retrieved 7 January 2013. 1 2 Lian Pin Koh and David S. Wilcove (2007). "Cashing in palm oil for conservation". Nature (subscription required). 448: 993–994. 1 2 Sarif, Edy (17 June 2011). "Malaysia expected to maintain position as world's largest producer of Certified Sustainable Palm Oil". The Malaysian Star. Retrieved 10 October 2012. ↑ McDougall, Andrew (22 June 2011). "RSPO names Malaysia as world's largest producer of sustainable palm oil". Cosmetics Design. Retrieved 10 October 2012. ↑ "Sustainable plam oil is good for business WWF study". World Wildlife Federation. 10 April 2012. Retrieved 10 October 2012. 1 2 Eshelman, Robert S. (November 3, 2014). "Indonesian government's concession policy prioritizes companies over forest communities". Mongabay. Retrieved 31 March 2015. ↑ Media, Tim (May 8, 2014). "Mina Setra Wakili Regio Kalimantan" (in Indonesian). Dewan Kehutanan Nasional. Retrieved 31 March 2015. ↑ "Burning palm oil fuels climate change". Friends of the Earth. Aug 23, 2006. ↑ Saunders, Daniel J.; Balagtas, Joseph V.; Gruere, Guillaume (March 2012). Revisiting the Palm Oil Boom in Southeast Asia (PDF) (Report). International Food Policy Research Institute. Retrieved 11 October 2012. ↑ "The greenhouse and air quality emissions of biodiesel blends in Australia". csiro.au. The Commonwealth Scientific and Industrial Research Organisation. 26 November 2007. Retrieved 16 October 2012. ↑ "FAQ: Palm oil, forests and climate change". greenpeace.org.uk. Greenpeace UK. Retrieved 16 October 2012. ↑ Jack Wong (20 September 2010). "Less carbon dioxide from oil palm estates". The Star. Retrieved 7 January 2013. ↑ Erin Vogele (16 March 2011). "Mission achieves ISCC certification, loses contract with Chevron". Biodiesel Magazine. Retrieved 15 January 2013. ↑ "RSPO Announcement: On the Approval from the European Commission of RSPO-RED, the Biofuels Certification Scheme of the Roundtable on Sustainable Palm Oil" (Press release). RSPO. 28 November 2012. Retrieved 10 January 2013. ↑ Adnan, Hanim (28 March 2011). "A shot in the arm for CSPO". The Star Online. Retrieved 16 October 2012. ↑ Watson, Emma (5 October 2012). "WWF: Industry should buy into GreenPalm today, or it will struggle to source fully traceable sustainable palm oil tomorrow". Food Navigator. Retrieved 16 October 2012. ↑ "How the Palm Oil Industry is Cooking the Climate" (PDF). greenpeace.org. Greenpeace International. 2007. Retrieved 18 October 2012. ↑ Gillespie, Piers; Harjanthi, Rahayu Siti (2 November 2012). "ISPO, RSPO: Two sides of the same coin?". The Jakarta Post. Retrieved 7 January 2013. ↑ "Having own palm oil certification hailed". Daily Express. 14 September 2011. Retrieved 7 January 2013. ↑ Hanim Adnan. (2013, September 4). "Malaysia to launch palm oil standard by next year," The Star. Accessed: October 5, 2013. ↑ Halimah M., Ismail B. S., Salmijah S., Tan Y. A. and Choo Y. M. 2012. A Gate-to-gate Case Study of the Life Cycle Assessment of an Oil Palm Seedling. Tropical Life Science Research 23:15-23. ↑ Zulkifli H., Halimah M., Chan K. W. & Mohd Basri W. 2010. Life Cycle Assessment For Oil Palm Fresh Fruit Bunch Production From Continued Land Use For Palm Planted On Mineral Soil (Part 2). Journal of Oil Palm Research 22: 887-894. ↑ Vijaya S., Choo Y. M., Halimah M., Zulkifli H., Yew A. T. & Puah C. W. 2010a. Life Cycle Assessment of the Production of Crude Palm Oil (Part 3). Journal of Oil Palm Research 22:895-903. ↑ Vijaya S., Choo Y. M., Halimah M., Zulkifli H. Yew A. T. & Puah C. W. 2010b. Life Cycle Assessment of the Production of Crude Palm Kernel Oil (Part 3a). Journal of Oil Palm Research 22:895-903. ↑ Tan, Y. A., Halimah M., Zulkifli H., Vijaya S., Puah C. W., Chong C. L., Ma A. N. & Choo Y. M. 2010. Life Cycle Assessment of Refined Palm Oil Production and Fractination (Part 4). Journal of Oil Palm Research 22:913-926. ↑ Ahmad, M. S., Subramaniam, V., Mohammad, H., Mokhtar, A., & Ismail, B. S. (2014). Cycle Assessment For Oil Palm Based Plywood: A Gate-to-Gate Case Study. American Journal of Environmental Sciences, 10(1), 86. ↑ Puah C. W., Choo Y. M. And Ma A. N. 2010. Life Cycle Assessment for the Production and Use of Palm Biodiesel (Part 5). Journal of Oil Palm Research 22:927-933. ↑ Chiew, Hilary (1 April 2008). "Developing countries play role to minimise global warming". The Star. Retrieved 2 January 2013. ↑ Varming, Soeren; Dutschke, Michael (14 May 2008). "CDM is promoting sustainable palm oil". Point Carbon Newsletter: CDM & JI Monitor. Retrieved 3 January 2013. 1 2 "2011 Palm Oil Buyers' Scorecard". wwf.panda.org. World Wildlife Foundation. 2011. Retrieved 3 January 2013. ↑ Watson, Elaine (21 June 2011). "Certified sustainable palm oil derivatives 'prohibitively expensive' in US". Food Navigator. Retrieved 3 January 2013. ↑ Lingga, Vincent (1 November 2012). "Consumer response to certified palm oil products still weak". The Jakarta Post. Retrieved 3 January 2013.